After the magnitude 9.0 earthquake and ensuing tsunami, much of Japan’s infrastructure was paralysed. In the worst hit regions, access to basic electricity and gas were unavailable and then were not provided in sufficient supplies once the recovery began. Several organisations jumped in to provide those affected with clean energy to help rebuild their lives. One of these was the Institute for Sustainable Energy Policies (ISEP), a Toyko-based independent non-profit research organisation. ISEP began a recovery assistance project in April that is supplying renewable energy to local communities along the 250 kilometres of Tohoku’s devastated coast. 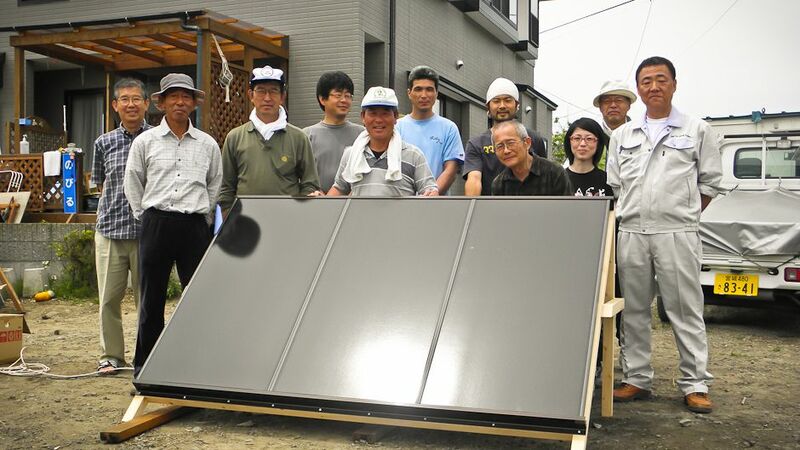 Through the Tohoku Unity and Warmth Project, or tsunagari-nukumori in Japanese, solar panels, solar water heaters and biomass boilers have been installed using local resources. The project has collected ¥40,245,819 (approximately US$524,769.53) from a total of 528 donors. Efforts have focused on providing electricity, hot water and hot baths to evacuation centers, public facilities and temporary housing in the Tohoku region. As of 20 September, more than 84 solar panels, 28 solar water heaters and 5 biomass boilers have been installed. 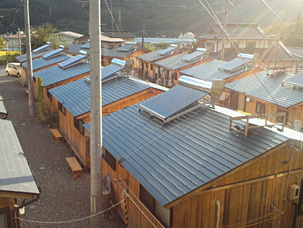 With the help of supporting organisations like the Renewable Energy Business Cooperative, a Unity and Warmth project member and expert in photovoltaic technology, solar power panels have been installed in public facilities and evacuation centres, giving residents a reliable source of electricity even during cloudy days or at night. Mr. Ninuma had no prior experience as an electrician, but through the Unity and Warmth Project has learned a new skill important for the sustainable rebuilding of the region. The project has placed a particular emphasis on incorporating local labour and resources into their projects. Solar panels in Ishinomaki supply 1.7 kilowatt hours of electricity, sufficient to power most home electronics or charge 500 mobile phones. Moreover, this initiative is providing some much needed positivity to the community. On a sunny day, the solar power panels in Ishinomaki supply 1.7 kilowatt hours of electricity. This is sufficient to power most home electronics, or, for example, charge 500 mobile phones. Moreover, this initiative is providing some much needed positivity to the community, according to the president of the local shrine hosting the project, “I feel that having some electricity will provide hope,” Ryusho Okuni said. In the future, the Unity and Warmth Project is hoping to implement this type of solar power project in schools in the region. Aside from providing an electricity source, the program hopes to educate children on the merits of renewable energy, while also giving knowledge and experience to future leaders in the field. Immediately following the triple disaster, the region faced weeks of near freezing temperatures and restricted access to gas. In some of the hardest hit areas, where reconstruction was slow, the Unity and Warmth Project has also been installing solar water heaters. On sunny days the water can reach between 50-60 degrees Celsius, giving residents access to warm water for dishes and baths. In one particular village, the water is being brought in from a nearby stream. Using sustainable resources such as this, the solar water heaters provide a guaranteed source of essential hot water for residents in need. Furthermore, the cost to residents and villages in the process of rebuilding is also reduced, providing a long-term incentive to maintain and implement more solar water heating projects in the future. Using biomass boilers, even public bathhouses, known as onsen, an important part of Japanese culture, are sustained even in some of the worst disaster-stricken areas. One of the key features of the project is the diversity of energy sources provided and drawn from renewable resources. Rather than relying on a dominant source of power (e.g., nuclear), this decentralised system contains an inherent resilience. In practice this means that in the event of major shocks to one of the system’s components, other sources of energy may continue to provide some power and comfort to residents. Where solar water heaters provide an invaluable source of hot water for small jobs (like cleaning dishes), wood boilers are used to heat large quantities of water for showers and baths. These biomass boilers are inexpensive to build and easy to maintain, and have even been installed on the back of trucks and mobilised across the region in order to teach residents a cost-effective method of producing heated water. Providing feed-stock for the boilers is not difficult in Tohoku. The tsunami devastation has left enormous amounts of debris, which is very costly and time-consuming to clean up. However, as local residents have found out, debris can be gathered and used for the boilers, reducing the burden of debris removal, and providing materials at little to no cost; literally solving two problems with one idea. Using sustainable energy, the devastated regions of Tohoku are building back faster, stronger and better. Moreover, the success of this project will provide a template for development of similar projects using and promoting renewable resources. The Unity and Warmth Project plans to expand its work in Tohoku, despite officially ending its reconstruction assistance in September of 2012. Currently, plans include construction of a ‘renewable energy school’ to share with locals of all ages, ideas about how to easily construct and maintain renewable energy systems. The project also hopes to work closer with local governments to push for inclusion of renewable energy in part of their reconstruction plans. The Unity and Warmth Project exemplifies why and how sustainable energy can be successful, even in some of the toughest times, for local communities. Using an education-centred approach,this project moves beyond traditional recovery assistance methods. This model, developed in partnership with ISEP is worthy of consideration by policy makers, and offers an innovative alternative to the current reliance on a limited number of energy sources. What was introduced as a recovery assistance program in some disaster-affected parts of Tohoku, now has the potential to bring unity and warmth to communities anywhere. Unity and Warmth for Japan’s Tsunami Survivors by Marna Romanoff is licensed under a Creative Commons Attribution-NonCommercial-ShareAlike 3.0 Unported License. Marna Romanoff has lived and worked in the Midwestern United States and Japan. She is an intern with the UNU and graduated with an M.A. in International Relations.